Samia ricini — “Eri silkmoth” | Welcome, visitor! 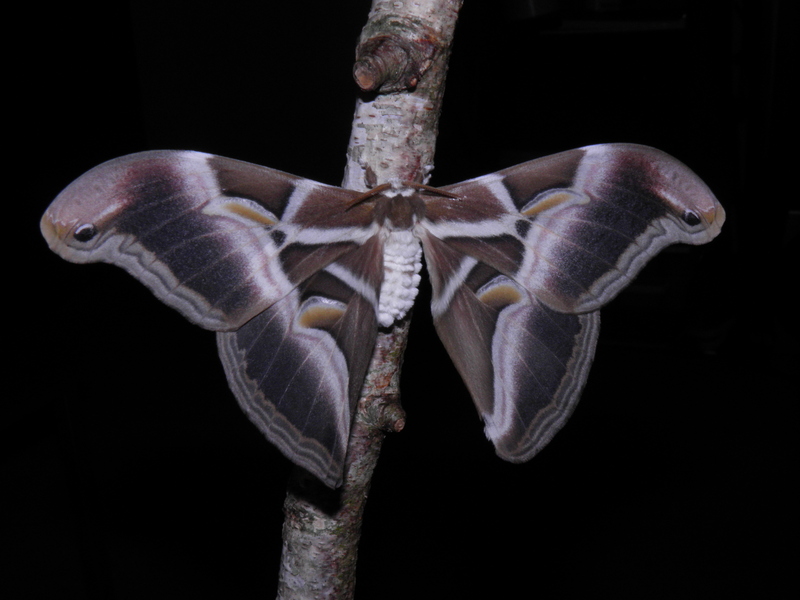 Samia ricini, the “eri silkmoth”, is a one of the most prominent “species” of Saturniidae. 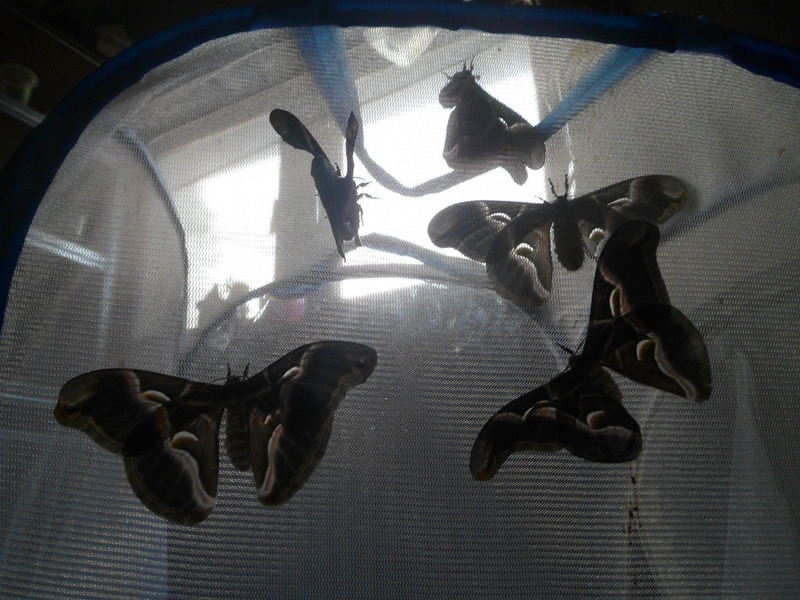 It is being bred on a massive industrial scale in Asia for silk production, and is also very populair with hobbyists that like to breed insects, and reptile owners that use them as convenient feeder animals. But wait.. why is “species” between quotation marks here? Well… that’s because Samia ricini is actually not a species. What is Samia ricini? Samia ricini, the eri silkmoth, is one of the few (semi) domesticated insects. Much like the housecat or dog, it was derived from wild silkmoth species by breeding them in captivity for hundreds of years. The “ricini” is not a true species, DNA analysis shows that it is a domestic polyhybrid that was created in captivity by humans – it was derived from several other Samia species such as Samia canningi and Samia cynthia and also others – and was then bred in captivity for hundreds of years. Thus another argument that supports that “ricini” is not a species can be made: not only have they been domesticated and are not found anywhere in the wild (they are not, in fact they probably can not survive in the wild well without humans rearing them) – but their DNA also proves them to be a hybrid derived from multiple species that still occur in the wild! A female of Samia ricini “eri silkmoth”, a remarkable specimen with more white scales than usual, although these moths can show a lot of variation in captivity. Natural range: N/A (“ricini” is not a true species, DNA analysis shows that it is a domestic polyhybrid that was created in captivity by humans – it was derived from several other Samia species such as S. canningi and S. cynthia, and then selectively bred for silk production for a few hundred years). But it originated from tropical Asia. The favorite host plants of Samia ricini include tree of heaven (Ailanthus), Ligustrum (privet), Ricinus (castor), Prunus (cherries) and many more. It is a very polyphagous moth that is easy to breed for beginners. Eggs hatch in 10 to 15 days time; the caterpillars can be reared from egg to cocoons in about 1-2 months time and the continuously brooded moths consecutively hatch from these cocoons in 1-3 months time, all of this depending on the temperature (the warmer, the faster they develop). Eggs can be hatched in a plastic container such as a petri dish and should be kept humid, but not wet. The cocoons have white, and soft silk. 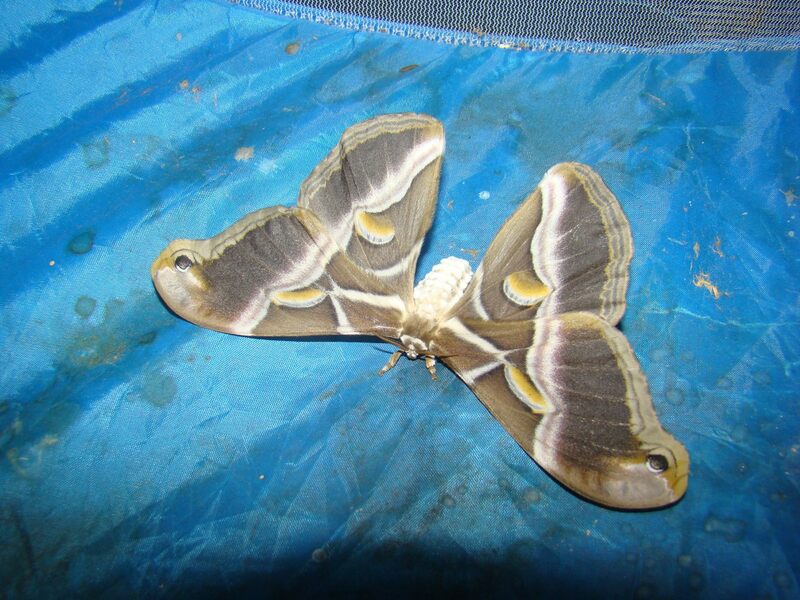 This moth was selectively bred by humans for hundreds of years for one reason; silk production! 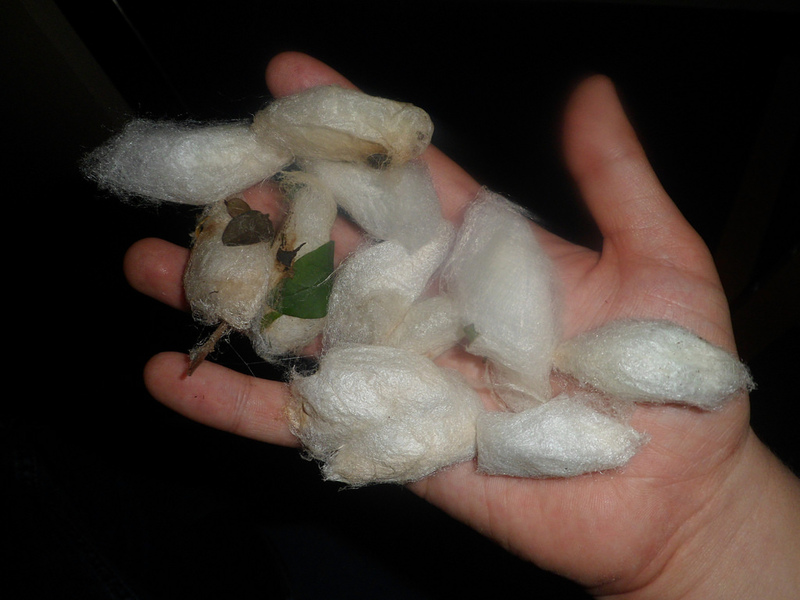 Their silk is of top quality, and very different from moths that spin cocoons in the wild. 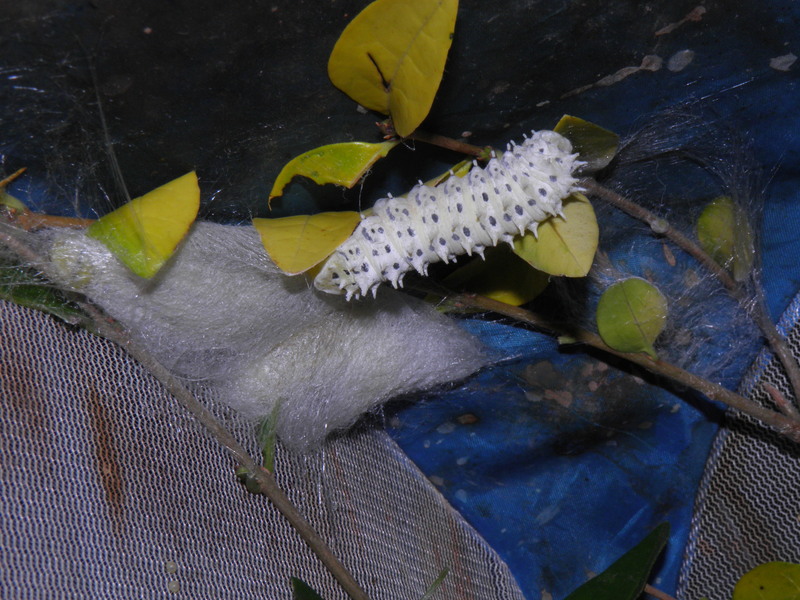 Most Samia cocoons are though and brown, but only the Samia ricini has milky, pale, soft white silk cocoons. The abdomen is mainly white. Real Samia species that live in the wild have brown or reddish abdomens, with a few white spots or stripes. But none of them have nearly completely white abdomens like Samia ricini does (although in some cases a few brown tufts are still visible). 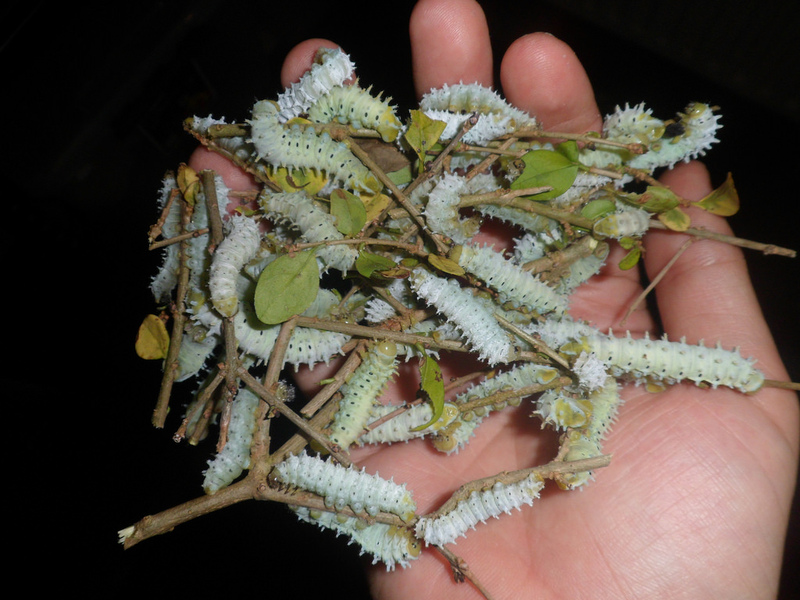 The larvae are mainly white. Loss of “wild” colouration and pigment is often seen in domesticated animals; Samia ricini is no different if you regard the aforementioned white abdomen, white cocoons and in some cases unusually thick white bands on their wings. 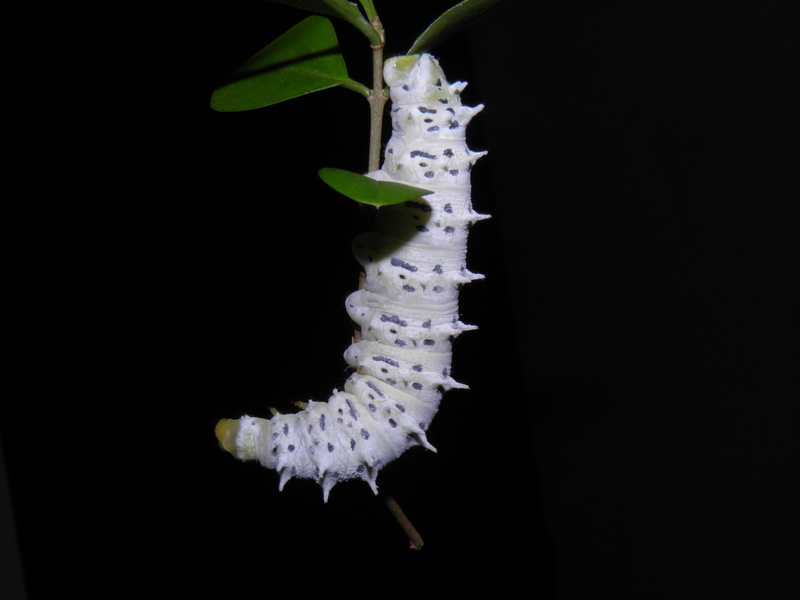 The caterpillar is no different: Samia ricini’s caterpillar is generally pale and white. This is one of the least defining traits, as some Samia ricini larvae can have black spots or a little bit of pigment, but this is generally rare; most of the time Samia ricini larvae are completely white and pale looking. Assymetrical/imperfect looking wings. This is not really a trait that is present in Samia ricini in all cases, but a direct result of two forces: inbreeding and selective breeding. 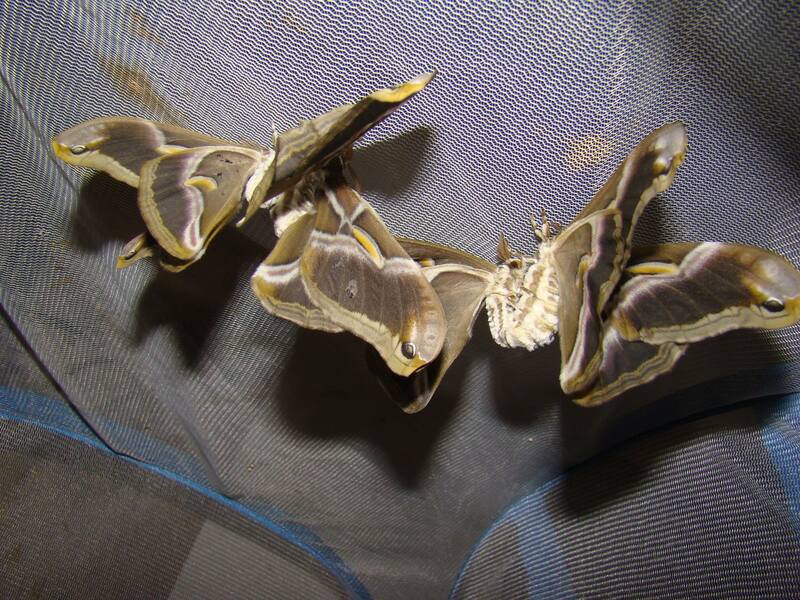 First of all, since flight capabilities are less important in captivity for survival – they are often paired in small cages where they only have to crawl a few centimetres to find a mate – it is not uncommon for domesticated moths to invest less in functional and thus often slightly deformed or assymetrical wings (think of Bombyx mori! ); and last but not least the vitality and condition of the animals is in some cases greatly reduced due to inbreeding, resulting in crippled adults due to the expression of recessive traits. Silky smooth; this image shows the pale, white, soft cocoons that unique for Samia ricini. They are of high quality silk that has commercial value. How to breed Samia ricini: Hatching the eggs is very straightforward, and should only take 10 tot 15 days in an airtight plastic container on room temperature; they hardly need any special are, although they appreciate being kept humid (but not wet!). The first instars of Samia ricini are communal; this means they live and feed in groups. This is convenient since this means you can keep many together in one container, and they will happily shed their skins, travel and feed together without being bothered by overcrowding. They can be reared in small, airtight containers. However, after a few weeks of rearing them the larvae will grow bigger and their needs will change. While the first three instars are gregarious (communal) and can be reared in high density, the final two instars (L4 and L5) become solitary and require much more privacy (space!) and ventilation. In fact, putting many fully grown caterpillars of Samia ricini together in one container will result in viruses and infections that will wipe them all out. From this point they should be kept in airy cages, or in a big container with a lid that is replaced with netting (or any kind of material that allows ventilation and air flow). Samia ricini can be sustainably bred in great numbers. The final instar larvae will go through a lot of plant material before maturing and spinning a cocoon. Samia ricini being reared in a greater amount in cages. Fresh food plant (replace often) and hygiëne (remove droppings) and a not too high density (they can generally stand being crowded, but overcrowding will result in viruses, bacteria and pathogens wiping them all out, so be mindful of how many you keep together. Finally, when the caterpillars are fully grown they will find a sheltered spot to settle down and pupate. Usually they choose to settle in a corner of their enclosure. Here they spin thick white cocoons. In some cases they even spin multiple cocoons together because larvae tend to have the same preferences and choose the same places in a cage to spin a cocoon; plus the fact they like the texture of silk to settle upon. They may also incorporate material such as leaves into their silk and decide to spin among leaves or leaf litter. 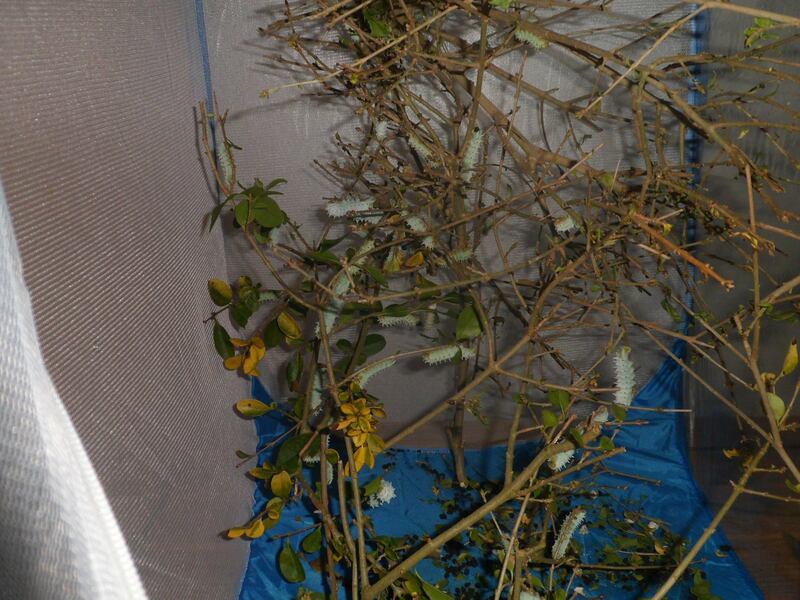 After they have spun cocoons, they can be removed and placed in the appropriate cage or container for the adults to emergence in; although it is generally adviced to leave the fresh cocoons alone for 7 tot 10 days so the caterpillars in them can pupate in peace before being handled and potentially disturbed. The adult moths will emerge quite fast (depending on temperature usually between 1 and 3 months). Keeping them humid and warm speeds up their emergence. While this species is quite easy, the most important thing is to keep the caterpillars slightly humid and their environment clean. 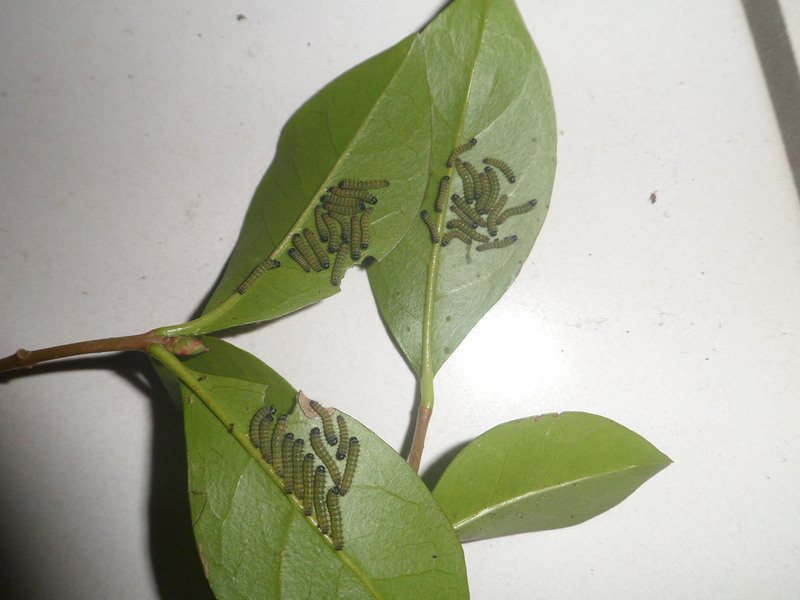 Especially when reared in large numbers their container should be hygienic The caterpillars are blueish/greenish to white and are covered with waxy power (this probably helps them become water-repellent.). The adults of Samia ricini generally only live for about 5 to 14 days; females live longer while males are shorter lives. They have a generally malformed appearance, since their wings are rarely in good condition. Samia ricini adults are very easy to pair; in fact they are one of the easiest possible moth species to pair in captivity. They usually do not need any help finding eachother. However, putting them close together so the tips of their abdomens touch is already enough to archieve a pairing. Females lay 50 to 250+ eggs, depending on the health and size of the female (the bigger and “fatter” the better). Although they are very willing to find eachother and pair, they may have trouble flying to archieve this goal. Samia ricini is nocturnal and mostly becomes active at night, although in some cases males will try to locate females during the day. 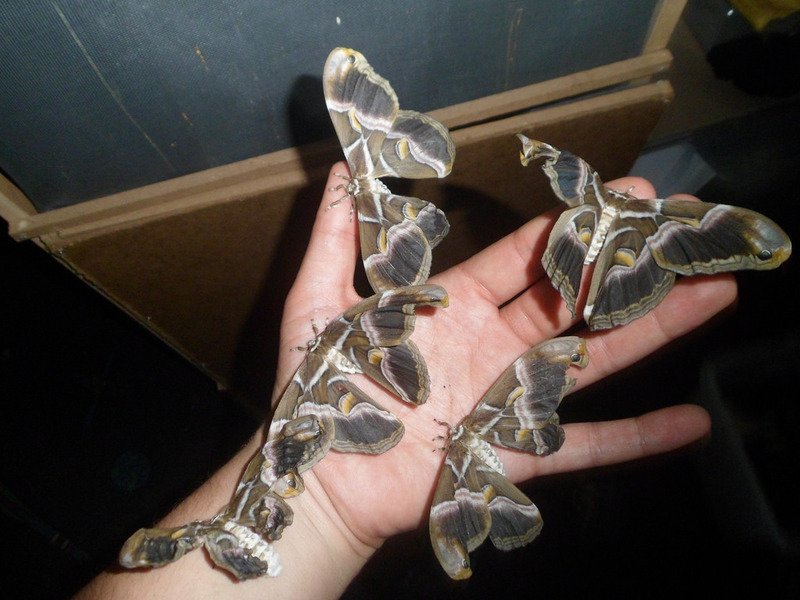 Pairing couples of Samia ricini moths. The males of this species are so eager to pair that they will pair with other species too; this makes it easy to hybridise them with other Samia species. Over the recent years I have bred many Samia ricini, but the experience is not always very enjoyable due to the heavy inbreeding going on in the hobby. The insects are in some cases mass-produced as reptile food and paired with their own siblings for many generations, something that negatively affects their health and appearance. In some cases I have raised broods that all emerged as severely crippled moths. 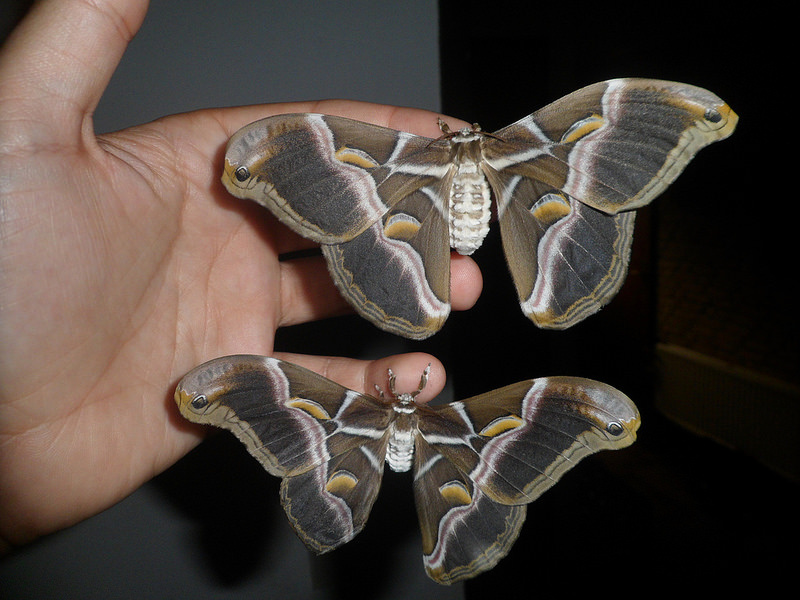 This would prevent most Saturniidae from breeding, but even such crippled Samia ricini are able to pair with eachother. While most Samia ricini are “supposed” to have a few imperfections as a result of being a domesticated creature made by humans, it is sad to see that in some cases people decide to continue bloodlines of heavily crippled insects. I do want to encourage all the breeders that read this page to select the healthiest looking adults to continue breeding with. Seeing a picture of the parents before you buy eggs also helps. Quite a sad sight.. due to massive captive inbreeding, Samia ricini commonly suffers from crippled individuals, which in my opinion, makes rearing them less enjoyable. In captivity, one of the plants that gives the best result is Ligustrum. Caterpillars do not sequester toxins from their poisonous food plants and are thus safe to use as feeder animals; they do however have a crop that stores food for 1-2 days (as a defense mechanism they may “vomit up” their crop/gut content, that may be toxic due to them feeding on toxic plants such as Ricinus communis) so it is best to not feed them for two days prior to feeding so their gut is clean. It is also interesting that a fairly large share of livestock being sold as Samia ricini may actually be hybrids of Samia cynthia and Samia ricini.